The Radox Apollo Towel Radiator features a modern take on the towel radiator design, with modern flat horizontal bars giving a mirrored finish. Its a shiny and super strong product that can "pack a punch". The Radox Apollo is a lovely product and would look great in any bathroom. 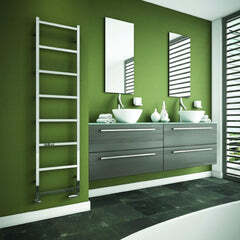 The Reina Rezzo Designer Towel Rail is a cut above! It is super luxurious looking with modern square bars creating a look that will wow! The Rezzo would look fantastic in any bathroom, or even your kitchen to hang tea towels on! The Reina Rezzo is available in Polished Chrome. 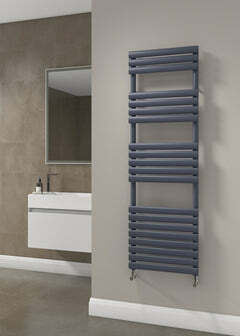 The DQ Vulcano T Towel Radiator gives a great heat output and has really contemporary and unusual U shaped bars. With its Italian Design and manufacture you know you are getting a quality product. This Towel Rail would look super in your bathroom. You can hang your towels over the bars to keep them lovely and toasty warm when you get out of the shower or bath. The Vulcano Towel is available in White, Dark Grey Texture, and choice of RAL Colours and Special Finishes. Please see images on the left to view options. To select a colour use the drop down to select RAL Colours, and then enter your colour choice in the notes section at the checkout. If you needed any assistance please contact us. An additional benefit of the Vulcano Towel is that the same design is also available in a horizontal radiator, and a vertical radiator - this means you can have the same look running right through your home - click on the links below to view. Delivery: 720 x 586mm, 1160 x 586mm, 1440 x 586mm, 1720 x 586mm in White and Dark Grey are stocked and available in 2/3 days. All other sizes and RAL Colours available in 4-5 weeks. The DQ Tornado Towel Radiator gives a classic yet modern look with its flat tubes. This Italian designed beauty comes in many different colours and finish. This Towel Radiator would look great in your bathroom. You can hang your towels over the flat bars to keep them lovely and toasty warm when you get out of the shower or bath. The Tornado Towel is available in White, Dark Grey Texture, and choice of RAL Colours and Special Finishes. Please see images on the left to view options. An additional benefit of the Tornado Towel is that the same design is also available in a horizontal radiator, and a vertical radiator - this means you can have the same look running right through your home - click on the links below to view. Delivery: 750 x 586mm, 1200 x 586mm, 1440 x 586mm, 1720 x 586mm in White and Dark Grey are stocked and available in 2/3 days. The Carisa Fame Vertical Aluminium Towel Radiator really is a classy radiator with straight square bars which will fits perfectly into every bathroom. The Carisa Fame would be fantastic in any bathroom. The Carisa Piazze Stainless Steel Towel Radiator has a modern design with bars looking like quadrates. This would make a real feature in a room. The Carisa Piazze would be fantastic in any rooms. The Radiator Company Stratos Stainless Steel Towel Radiator is a stunning towel rail, with luxurious rounded bars open at one end for easy placing of towels. The Radiator Company Stratos Towel Radiator is available in beautiful Polished Stainless Steel. 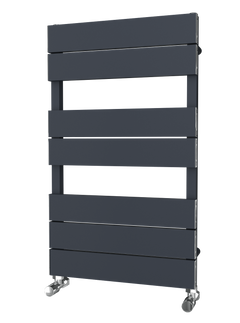 The Eskimo Holy Rail Radiator is a fun and practical radiator, with an inspired dual purpose design, both heating the room and warming your towels. The towel slots are a great size, meaning the end of wet towels being left around the house. 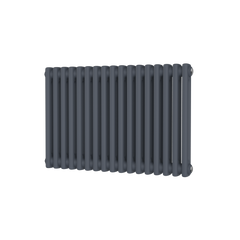 The Holy Rail is a part of the Outline range, which are modular aluminium, high output radiator ‘engines’ with various stunning options of front fascia panel. This rad comes in a host of different colour options, with 29 standard RAL colours available. Please select from the chart and then the drop down the awesome colour you require. The Holy Rail has really high heat outputs. With low water volume and diverter fitted as standard means rapid warm up and perfect for low temperature heating systems such as heat pumps. It also available in electric versions. The Radox Premier Curved Towel Radiator increases depth and allows easier towel storage. With the bars being individually hand curved before assembly, the rail has greater ornamental appeal.